We'll make our way up from the beach via the steps by the Porto Belissario hotel and then take a stroll up a track that will take us to the north east corner of the village. Now you may think that I'm puffed already, half way up the stairs but honestly, I've only stopped to admire this dragonfly. 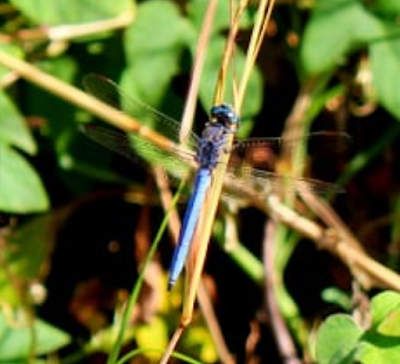 As you may already know, dragonflies and damselflies form a common group called the Odonata and you can tell them apart by the way they hold their wings at rest. Folded above the body: damselfly. Held out away from the body: dragonfly. There are 19 species of dragonfly on Crete in three families and this is one of the Skimmers from the largest family, the Libelluidae. Nature is the ultimate jigsaw puzzle and being able to recognise a dragonfly and the family it belongs to is very much a first step; like the initial sorting of the pieces. How many Spotted Sea Hares can you see in this picture? Sea Hares are a type of Sea Slug and are molluscs like the slugs and snails in your garden. They are called Sea Hares because of their large, hare-like 'ears'. They are not ears at all in fact but act more like noses. When Sea Hares want to make more Sea Hares they form mating chains and advertise the fact by sending out pheromones which other sea hares pick up through these chemosensory organs called rhinopores. As things can be a bit confusing in a mating chain sometimes the best way to determine the number of Sea hares in a chain is to count the rhinopores and divide by two! I think that I can see ten rhinopores in this picture which makes five Sea Hares. Maybe you can see more? Here we are at Rodinesque Point, a lovely set of rock pools that never fail to throw up some curious creatures. Before we plunge in though let's have a look at some of the algae that are growing on the rocks. The larger ones are called Peacock's Tails which you may remember we met in the Blue Lagoon; the ones used in anti-wrinkle cream. The ones that look a bit like satellite dishes on stalks are Mermaid's Wine Glasses and both are considered a delicacy by the pretty little sea slug, Elysia timida, which lives around here so keep your eyes peeled. Incidentally you won't find Rodinesque Point on any map, it's a name I've given the area because of that weird rock formation on the headland which looks as though it has been sculpted by Rodin.